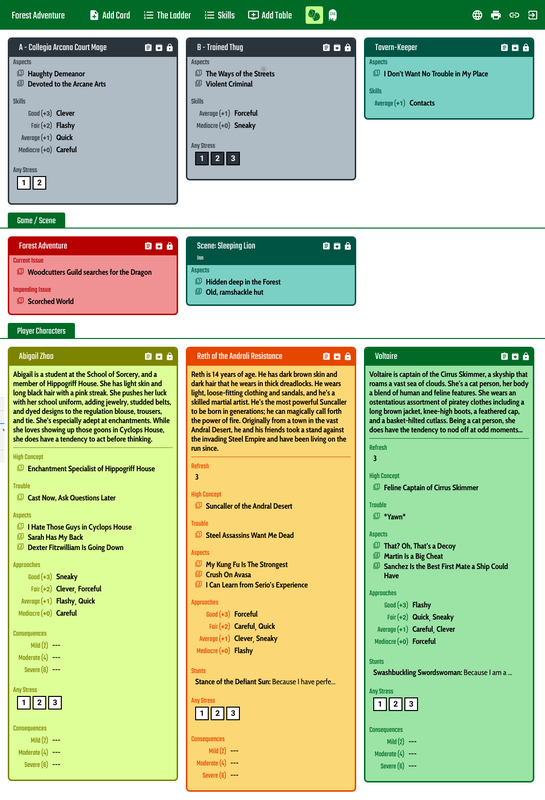 The RPG Note Cards is a web application for playing Fate Core or similar games with others over the Internet. I created this app to play the Fate Core with my friends. I've been looking for an existing solution for a long time, but I've always come to something that supports the game with miniatures, mapping, and complex character sheets. This has but little use in the Fate. In the Fate games we need only a simple way to create sticky notes and place them on shared game table where they are clearly visible for reference. Then a couple of tokens and dices. The RPG Note Cards is developed with the Fate Core in mind but it can be used to play any other similar games. If you are missing support for some game mechanics or information presentation for your game which can be fitted in the paradigma of the application, please contact me on the feedback email. If you find a bug in the application or if you think the application can be improved to better fit your play style please contact me at feedback email. If you want to have Ladder or Skill List in your language and don't want to fill it each time you create a new game, send me the translated list and I will add it to the ladder/skills presets. If you want to help me by translating the UI to your language, please contact me. I will be happy to add additional languages. Přečtěte si prosím Základní koncepty než začnete hrát poprvé. Added Traditional Chinese localization (thanks to Wei Hung/洪偉). Added German localization (thanks to Markus Raab). Stable Ordering: Cards within the group are ordered by their title. This ordering is just a hint for the card positioning engine which tries to reorder the cards to make them use less space. Copy Card Action: Cards can be created from another card by one click. Use icon content_copy in card header. 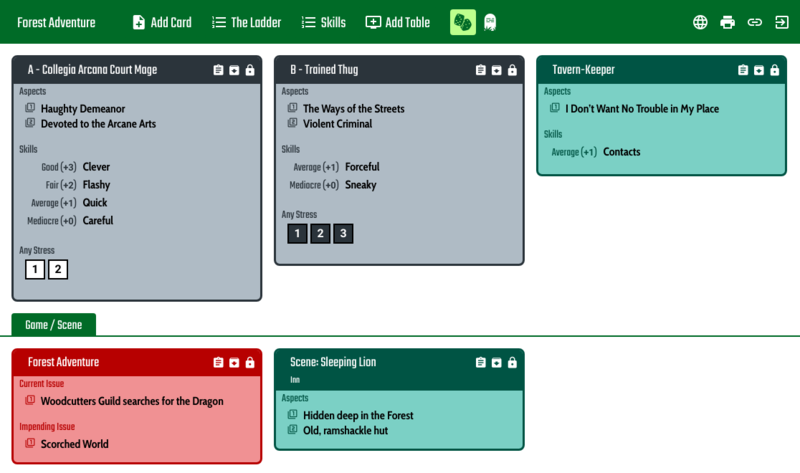 This functionality can be used to prepare card templates. - References and use of the materials from products of Evil Hat Productions, LLC. Licensed under CC-GO 3.0 license. - Icons from game-icons.net (contributors) licensed under CC-GO 3.0. Contributors: Dmitry Minchenkov & Dmitry Valkov (RU localization), Markus Raab (DE localization).